Naomi Hirahara was born in Pasadena, California. Her father, Isamu (known as "Sam"), was also born in California, but was taken to Hiroshima, Japan, as an infant. He was only miles away from the epicenter of the atomic-bombing in 1945, yet survived. Naomi's mother, Mayumi, or "May," was born in Hiroshima and lost her father in the blast. Shortly after the end of World War II, Sam returned to California and eventually established himself in the gardening and landscaping trade in the Los Angeles area. After Sam married May in Hiroshima in 1960, the couple made their new home in Altadena and then South Pasadena, where Naomi and her younger brother Jimmy grew up and attended secondary school. 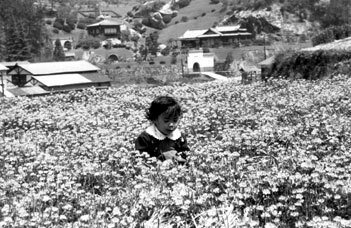 The author, on a visit to Hiroshima at the age of three. Naomi received her bachelor's degree in international relations from Stanford University and studied at the Inter-University Center for Advanced Japanese Language Studies in Tokyo. She also spent three months as a volunteer work camper in Ghana, West Africa. She was a reporter and editor of The Rafu Shimpo during the culmination of the redress and reparations movement for Japanese Americans who were forcibly removed from their homes during World War II. During her tenure as editor, the newspaper published a highly-acclaimed inter-ethnic relations series after the L.A. riots. Naomi left the newspaper in 1996 to serve as a Milton Center Fellow in creative writing at Newman University in Wichita, Kansas. After returning to Southern California in 1997, she began to edit, publish, and write books. She edited Green Makers: Japanese American Gardeners in Southern California (2000), published by the Southern California Gardeners' Federation and partially funded by the California Civil Liberties Public Education Program. She then authored two biographies for the Japanese American National Museum, An American Son: The Story of George Aratani, Founder of Mikasa and Kenwood (2000) and A Taste for Strawberries: The Independent Journey of Nisei Farmer Manabi Hirasaki (2003). She also compiled a reference book, Distinguished Asian American Business Leaders (2003), for Greenwood Press and with Dr. Gwenn M. Jensen co-authored the book, Silent Scars of Healing Hands: Oral Histories of Japanese American Doctors in World War II Detention Camps (2004) for the Japanese American Medical Association. Under her own small press, Midori Books, she has created a book for the Southern California Flower Growers, Inc., A Scent of Flowers: The History of the Southern California Flower Market (2004). Other Midori Books projects include Fighting Spirit: Judo in Southern California, 1930-1941 (co-authored by Ansho Mas Uchima and Larry Akira Kobayashi, 2006). Summer of the Big Bachi (Bantam/Delta, March 30, 2004) is Naomi's first mystery. The book, a finalist for Barbara Kingsolver's Bellwether Prize, was also nominated for a Macavity mystery award. The completion of the novel was made possible by support from the California Community Foundation's Brody Arts Award; Hedgebrook in Whidbey Island, Washington; Pacific Asian Women Writers-West; UCLA Extension Writers' Program; and again, the Milton Center, which has since moved to Seattle, Washington. Receiving a starred review from Publishers Weekly, Summer of the Big Bachi has been included in the trade magazine's list of best books of 2004, as well as the best mystery list of the Chicago Tribune. Gasa-Gasa Girl, the second Mas Arai mystery, received a starred review from Booklist and was on the Southern California Booksellers' Association bestseller list for two weeks in 2005. Most recently Snakeskin Shamisen, the third in the series, was released in May 2006. In April 2007 it won an Edgar Allan Poe award in the category of Best Paperback Original. She has short stories published in a number of anthologies, including Los Angeles Noir (Akashic, May 2007), A Hell of a Woman: An Anthology of Female Noir (Busted Flush Press, December 2007), and The Darker Mask (TOR, January 2008). In the summer of 2008 her first middle-grade book, 1001 Cranes, was released by Random House's Delacorte imprint in hardback and came out as a Yearling trade paperback in June 2009. It was recognized with an Honorable Mention award in Youth Literature by the Asian/Pacific American Librarians Association. The fourth Mas Arai mystery, Blood Hina, was published in hardcover March 2010 by St. Martin's/Thomas Dunne Books. Trade paperback and new ebook version were released in 2013 by Prospect Park Books, the publisher of the fifth installment, Strawberry Yellow. The first book in Naomi's new mystery series for Berkley Prime Crime featuring a 23-year-old LAPD bicycle cop, Murder on Bamboo Lane, was released in April 2014. The second installment, Grave on Grand Avenue, was published in April 2015. Naomi and her husband Wes make their home in Southern California. Her mystery serial, "Heist in Crown City," appeared in Asahi Weekly in Japan two times a month. She leads a number of writing workshops and taught a bilingual writing class at the Japanese Retirement Home in Los Angeles, organized by Poets & Writers, Inc. and funded through an NEA grant. Naomi served as chapter president of the Southern California chapter of the Mystery Writers of America in 2010. Listen to an interview with Naomi about the Mas Arai Series on Morning Edition!